The Department of Electrical And Electronics Engineering was established in the year 1993 with the approval of AICTE with a sanctioned intake of 60 students. 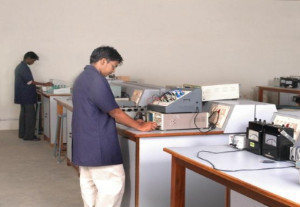 It offers undergraduate programme of B.E Electrical and Electronics Engineering. A post graduate course in Power Electronics and Drives with a sanctioned intake of 18 students was started in the year 2004-2005. Faculty and students benefit from guest lectures on the latest innovations in both established and emerging fields. Campus interviews are conducted every year by leading software and hardware companies. The department has got well equipped Laboratories and Computer facilities along with high speed Internetwork.The College Academic Council and Board of Studies of the department strive to provide quality education with the most advanced curriculum to make the students industry ready and excel in the contemporary business world. 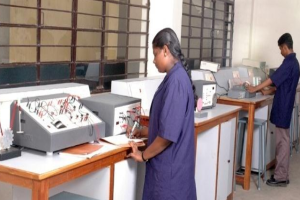 By imparting quality education and state of art training to the students and make them excel in the domain of electrical and electronics engineering with integrity and ethical standards. To provide an environment to students to mould them as competent engineers with skills and character leading to social transformation and National development. To prepare engineering graduates with deep understanding of fundamentals of Electrical Engineering. To prepare professionals with good technical skills, positive attitude and ethical values. To collaborate with industry, research organisations and academia to encourage creativity and innovation. To provide them a platform for developing new products and systems that can help industry and society as a whole. EEE is a subject that naturally partners with other disciplines to open whole new engineering avenues. Examples include Mechatronics - with Mechanical Engineering, Bio-medical Sciences-with Medicine and Avionics-with Aeronautics. The EEE Department at SPIHER prepares students in this field using new-age information and computer-intensive technologies. The B.E. degree program is designed to achieve a balance between depth of knowledge acquired through specialization and breadth of knowledge gained through exploration. The undergraduate degree courses offered by the department provide a comprehensive foundation in the core topics of EEE coupled with an area of specialization relevant to emerging engineering challenges. PEO1: Acquire a successful career in electrical industries, allied fields and entrepreneurship withprofound knowledge in core engineering. PEO2: Pursue higher education and involve in research activities to gain in-depth knowledge inelectrical and electronics engineering. PEO3: Exhibit intellectual skills, ethics and pursue life-long learning to cater the societal needs. Graduates will demonstrate their knowledge in effective implementation during their practice of profession of Electrical Engineering with due regard to environment and social concerns. Graduates will demonstrate their knowledge in analysis, design, erection and laboratory experimentation regarding Electrical Engineering. Graduates will be motivated for continuous self-learning in engineering practice and pursue research in advanced areas of Electrical Engineering in order to offer engineering services to the society, ethically. The M.E (Power Electronics and Drives) programme is one of the main specialization areas often preferred by students with electrical, electronics, instrumentation and other relevant background. This Programme is being offered at SPIHER, Chennai from 2005. This Programme caters to the needs of industries ranging from domestic appliance manufacturers to high end automation service providers. One of the key highlights of the M.E Programme being offered at SPIHER, Chennai is the research experience gained by the students .In EEE, there is growing awareness that the future training and education of electrical engineers in the industry needs to be in the area of highly efficient, industry-relevant skills formation, to enable frequent and rapid deployment of professional skills in new areas. As a step in this direction, the postgraduate programs in power electronics & drives is evolved. (iii) visiting to industries and participating in professional activities. The research division covers various aspects of electrical engineering. There is an active and growing area of research in the field of power electronics & drives, power apparatus and systems, whilst collaborating with each other and a variety of industrial partners. The research group focuses on power electronic devices and integrated circuits, and their uses in various applications. Other major research strands include FACTS and their integration in power systems, integrated design of electrical machines and drives and electromagnetic modeling. MOU has been signed with Florance Energy Solutions Pvt . Ltd. Technologies on 29th November 2017 for the benefits of research programmes and Research Scholars with the collaboration of Research and Development Units.